Crank handle allows complete control of opening. Can be left open without letting in natures elements. Allow fresh air to circulate throughout your home. 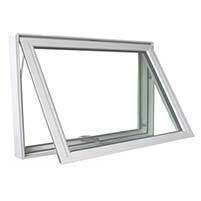 Can be used alone, side by side, or stacked above other windows such as casement windows. Awning windows are most commonly used because of their versatility. They can be installed in combination with other different style of windows. They are usually installed anywhere you have to reach out, such as in the kitchen above your sink or counter, or in the bathroom by your shower. If you are looking to obtain the most ventilation without compromising your privacy, an Awning window would be your best choice. Windows can be one of the most rewarding exterior home renovation you can invest in due to the energy savings and protection they bring your home. 1st Choice Home Solutions offers a selection of awning windows made with high quality materials.